And so to yet another movie tie in, and, it has to be said, not the best in its genre. If you're after cute rendered cars, just as in the movie, with games that you can pick up and put down, especially for younger children, then you'll be happy enough. 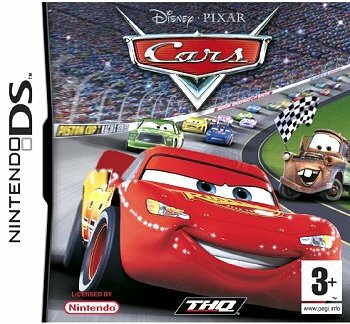 But as a gaming title in its own right, Cars is disappointing. Set over twelve 'mini games' and four race tracks, you have to work your way through Cars in a roughly sequential fashion, with each set of completed mini-games (e.g. fishing for garbage with Mater's tow hook or a Simon-like light pattern match) unlocking the next track. 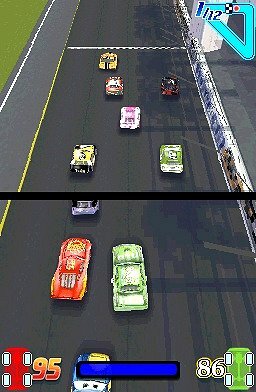 Each mini-game will only take a couple of minutes to complete on average, meaning that the racing itself is where the game will rise or fall. Unfortunately, gravity's winning with Cars and there's no real sense of racing around a track - this is more a glorified, colourfully-rendered racing game along the lines of the segmented Game 'n' Watch variety. You basically avoid slower moving cars as the move down the screen and race against your one true opponent, Chick Hicks, who annoyingly doesn't really race in her own right but rather drives at roughly your speed, however fast or slow, making her hard to beat. A mini-game based around tyre changing in a pitstop is the only real relief. Instructions are provided before each stage of the game, with keypad control during races and touch-pad control in the mini-games. Despite the polish here and there, Cars is ultimately uninspiring and may disappoint anyone who buys it at full price.